SOLD FOR FULL LISTING PRICE WITH MULTIPLE OFFERS! 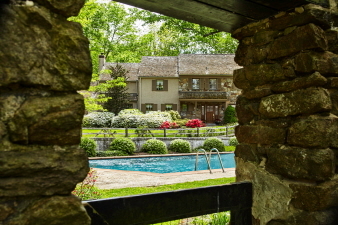 As you enter from the private drive, passing old stone walls, you'll feel like you've found your own "secret garden". Nestled far back from the road, the Green Bank barn creates a stunning setting that simply cannot be duplicated. Recently updated neutral decor throughout the lovely 5 bedroom, 3 bath Chester County farmhouse-style home. A one-of-a-kind property to enjoy now and cherish for years to come..